GEMI Executive Director Greg Bean, left, Bauer Senior Professor of Practice Christopher Ross. A combination of technological and social forces is increasing the likelihood of rapid penetration of electric vehicles in the light duty vehicle market, according to the first in a white paper series produced by Bauer College’s Gutierrez Energy Management Institute in conjunction with UH Energy. 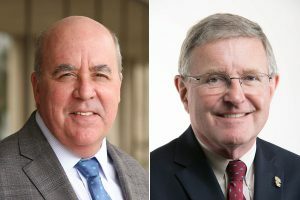 Written by GEMI Executive Director Greg Bean and Bauer Senior Professor of Practice Christopher Ross, the paper examines significant advances in electric vehicle technology and charging technology, the growth of renewable electric power generation and autonomous vehicle technology and trends in government regulation and policy. Together, they suggest a game-changing scenario for the energy industry. The paper is partially based on insights from a GEMI symposium and workshop that included high-level executives and thought leaders from the oil, gas, power and renewable energy sectors, as well as investment banks, think tanks and nonprofits. UH was represented by faculty from the business, engineering and law schools, as well as business school students.